H.E. Yongdzin Lopön Tenzin Namdak Rinpoche is the most senior teacher of the Bön tradition and is considered the world’s foremost expert on Bön. Yongdzin Rinpoche was born in 1926 in Khyungpo Karru, the Khyunpo district of Kham province, of eastern Tibet. At age 7 he entered Tengchen Monastery, a local monastery, where his uncle served as chant leader. There he began an extensive education course and at age 14 he took his vows as a monk. In 1940, at age 15, the young monk traveled with his uncle to Yungdrung Ling, a leading Bön monastery in central Tibet. While there from 1940 to 1942, he spent most of his time helping to execute wall paintings, making use of his training, since age 11, as an artist and painter. In late 1942, he went on a pilgrimage in Nepal and western Tibet, returning to Yungdrung Ling in mid-1943 to begin his studies in philosophy. From 1944 until late 1948, Yongdzin Rinpoche lived and studied with his tutor and the master Gangru Tsultrim Gyaltsan Rinpoche, who had retired after 18 years of service as lopon, the principal teacher, of Yungdrung Ling. Much of this period was spent in seclusion in a remote meditation cave at Juru Tso Lake in Namtsokha, northern Tibet, where Gangru Ponlob Rinpoche taught him grammar, poetics, monastic discipline, cosmology and the stages of the path to enlightenment according to sutra, tantra and dzogchen teachings. During this time, along with his busy schedule of scholarly pursuit on various profound subjects of philosophy and general Tibetan sciences, he managed to complete the 900,000 accumulations of the Ngöndro practices and the dzogchen practices of trekchöd and thögal with profound accomplishment. At the conclusion of this time, in late 1948, he traveled to Menri Monastery in Tsang province, in central Tibet, to complete his studies towards a geshe degree (the Tibetan equivalent of a doctorate in philosophy). His main teacher at Menri was Lopön Sangye Tenzin Rinpoche. In 1952, at the age of 27, he was awarded his degree, and that same year was elected to succeed his master as lopon, principal teacher, of the monastery. By 1957, the conflict was escalating in central Tibet between native Tibetans and the encroaching Chinese Communists, and at which time Lopön Tenzin Namdak Rinpoche retired from his activities as lopon. He traveled to Se-zhig Monastery on the Dang-ra lake in northern Tibet and remained in retreat there until 1960, just after the Lhasa uprising against the Chinese Communist occupiers. Amid the violence and occupation, many famous living Tibetan masters of the time were forced to flee their homeland, among them H.H. the Dalai Lama and H.H. the Gyalwa Karmapa. Lopön Tenzin Namdak Rinpoche attempted to escape on foot, along with group of lamas and monks of Menri, including the 32nd abbot of Menri, his foremost disciple, carrying with them important Bön texts and relics. However, on the way south toward India he was shot by Chinese soldiers. Thinking him dead, the Chinese left the great master lying in the dirt. One of his attending monks helped him to a nearby family, who took him into hiding. In his escape Yongdzin Rinpoche was able to hide the famous stupa of Nyame Sherab Gyaltsen together with statues, precious relics and other sacred objects in a cave at Lug-do Drag in the area of Tsochen, Tibet. When he had recovered enough to resume his travels, he carried with him volumes of texts to ensure their preservation. These sacred objects are now safely restored in Menri Monastery, Tibet. For approximately 22 days, the escape party traveled by night and hid out during the day until they had reached the safe haven of Nepal bringing with them the many volumes of important Bön texts. In Nepal, he stayed for some time at Najyin Monastery, Kathmandu. In 1961 he met the renowned English Tibetologist Dr. David Snellgrove of London University, who invited him to London along with Geshe Sangye Tenzin (the late H.H. Menri Trizin) and Geshe Samten Karmay. Under a Rockefeller Foundation Grant from their visiting scholar program, Lopön Tenzin Namdak lived in England, first at the University of London, and then at Cambridge University. Thereafter he made a retreat at a Benedictine monastery on the Isle of Wight. His three years in England, 1961–1964, and the collaboration with Dr. Snellgrove culminated in the 1967 publication in English of The Nine Ways of Bön (Oxford University Press), as the first scholarly study of the Bön tradition to be published in the West. In 1964 he returned to India where he republished precious Tibetan texts. He also assumed the critical task of raising funds to establish a Bönpo settlement and monastery in northern India. From 1964 to 1967 Lopön Tenzin Namdak worked desperately to keep the Bönpo people and their culture alive in exile. In 1967, with financial assistance from the Catholic Relief Service, he bought a tract of land at Dolanji, near Solan in Himachal Pradesh in northwest India, and founded a Tibetan settlement, school and monastery there. Following the 1963 death of Kundun Sherab Lodroe (the 32nd abbot of Menri), the abbot of Yungdrung Ling, H.H. Sherab Tenpai Gyaltsen, became the temporary spiritual leader of the Bönpo community in exile. With the leadership of H.H. Sherab Tenpai Gyaltsen and the inspiration of Lopön Sangye Tenzin and many other lamas, Yongdzin Rinpoche took the responsibility for locating a successor to the deceased abbot. In March 1968, Sangye Tenzin Jongdong (H.H. Lungtok Tenpai Nyima) was selected in the traditional Bön way as the 33nd Menri Trizin, throne holder of Menri Monastery; and thus became the spiritual leader of Bön. Together, Yongdzin Rinpoche and H.H. Menri Trizin worked to build the monastic community in Dolanji, which at the time was the only Bön monastery in India. In mid-1968 Yongdzin Rinpoche made a second visit to Europe and served as visiting scholar at the University of Munich. From 1969 to 1978 he continued his work at Dolanji, including writing, publishing, practicing, transmitting initiations and teaching the lamas and monks. Upon the death of Lopön Sangye Tenzin in 1977 after a protracted illness, he was given full responsibility for teaching the younger generation of monks. In 1978 a dialectic school was established and organized under his guidance. In 1986 the first class of monks graduated from the Dialectic School with their geshe degrees. That year Yongdzin Rinpoche traveled to visit Tibet; and upon his return via Kathmandu, Nepal, with money and some loans, he acquired a small piece of land where he would build the future monastery of Triten Norbutse. The monastery was formally founded in 1987 on its site at the foot of Nagarjuna hill to the west of the famous hill of Swayambhu at the far end of the Kathmandu Valley. Triten Norbutse has now become one of the two main Bön monasteries outside Tibet, providing an extensive and rigorous comprehensive study of the broad spectrum of Bön teachings and traditions. Today over 170 resident monks study and practice there. Yongdzin Tenzin Namdak Rinpoche has maintained a regular teaching schedule there, while making numerous excursions to teach the important Bön texts in the West. In 1993, Heart Drops of Dharmakaya, his commentary on Shardza Tashi Gyaltsen Rinpoche’s book of dzogchen practice, was published in English by Snow Lion Publications. 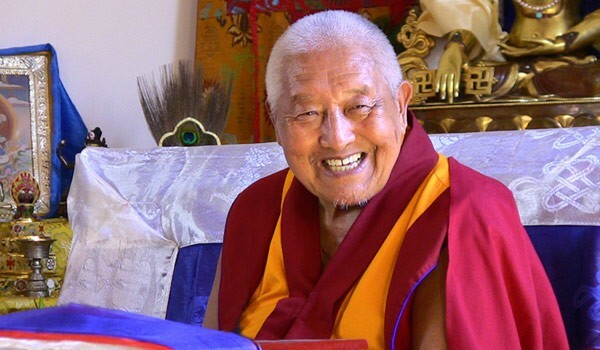 Since 1995, Yongdzin Rinpoche has visited Europe on a regular basis to give teachings, and has also frequently visited the United States at the invitation of his former students. He has regularly taught retreats in France, where the Association Yungdrung Bön was set up by his Western students to facilitate his work in the West and in particular Europe. In 2005 Shenten Dargye Ling, a congregation legally recognized by the French government, was established in Blou, France for the preservation, research, teaching and practice of Yungdrung Bön. The information in this account is drawn in large part from Bonpo Dzogchen Teachings according to Lopon Tenzin Namdak, transcribed and edited by John Myrdhin Reynolds. Kathmandu, Nepal: Vajra Publications, 2006; and was further revised for accuracy by Khenpo Tenpa Yungdrung Rinpoche, the current abbot of Triten Norbutse Monastery.